Summary: All I can tell you is that if you’ve ever dreamed of slipping on the sandals, donning that toga and sharpening up that stiletto dagger, this is the game for you. 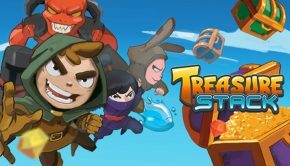 You’ll learn a lot of history and you’ll have a deal of fun, and maybe after a month or two, you’ll be the most powerful person to ever cast their shadow across the ancient world. I’m not sure if having never before played a Total War game means I’m the best person to review Creative Assembly’s new Total War: Rome II, or the worst. Past Total War releases have been intriguing, but those big sweeping battles that seem their selling point to fans always just intimidated me. I pictured my poor PC sweating over the graphics requirement, and my head slowly imploding as I frantically scrolled in, out and across the map trying to figure where my focus should be. I’m afraid I’ve always been more a top-down Command & Conquer type RTS guy. However micro-management is my thing, I’m a Sid Meier fanboy from way back, and the opportunity to play God- I mean Jupiter, over one of my favourite eras of history was simply too tempting to pass up. 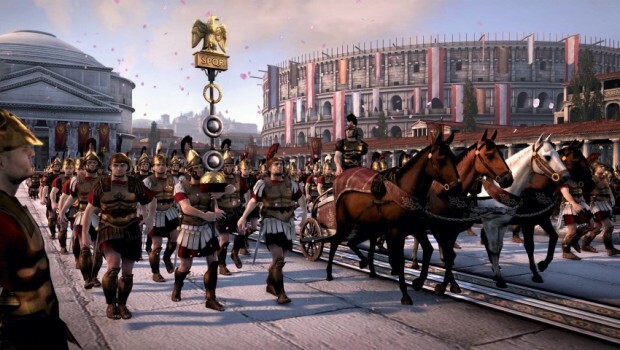 The original Rome: Total War was released a decade ago, so CA have had plenty of time to think about what they could do better with the sequel, and plenty of practise on several other Total War releases since the early noughties. A return to the swords n’ sandals era was overdue, and so I can report straight off the bat that despite a few not-so-surprising flaws and bugs, Rome 2’s vast scope, beautiful graphics, ambitious gameplay, exquisite detail, and ruthless politics means it is one for every armchair general to enjoy – but only IF you have a high-end PC. I can’t comment on what past Total War efforts have looked like, but if it’s anything like the sumptuousness of Rome 2, then I might be making a few more CA purchases. The playing board is colourful and exaggerated map of ancient Europe. On it you will steer your chosen nation to glory by managing cities, engaging in diplomacy and marshalling armies to conquer new regions. When your forces come up against an opposing army, you’ll have the option of either auto-resolving the action or flying into a real-time battle, managing the combat, and making sure your boys come home with a victory. The user interface is largely just basic icons and brief text with pop-up explanations on what you’re looking at. These are handy to the novice like myself, but I would have appreciated more. Most aspects of the game are explained, but not all, and I did find myself sometimes wanting for a manual. The relief is in turn-based games like Rome 2, you’re granted that relaxed pace you need to climb the rather steep learning curve. Rome 2 begins in 272 BC, with nine playable nations to jump into (Egypt, Carthage, Macedon etc. all the stars are there) and dozens of other non-playable trouble-makers, from Britannia to the Gauls, Africans, Germans, Syrians, etc. all keen to expand their territory. The campaign map spans from modern-day Afghanistan to Portugal, and is divided into 57 provinces. Provinces are groupings of up to four regions, and each region within a province can be conquered separately. Moving your armies about the map like chess pieces, you’ll first realise they won’t move at all unless you’ve attached a general to them, and your amount of generals is metered by the size of your empire. As with most strategy games these days, your armies can gain xp and up their stats as they tally victories. The ultimate goal being to assemble yourself a truly terrifying legion. 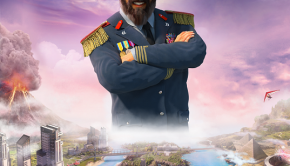 Generals recruit new troops directly in the field, which saves time and is refreshing change from the old ‘build-a-barracks-and-march-men-to-the-front’ RTS cliché. Controlled provinces & cities are used for all the traditional strategy duties; collecting taxes, gathering resources, improving war technologies, and for making sure the local populace is kept under the thumb via some cold-blooded political machinations; sneaky alliances, assassinations, bribes, purges – all are available. Hey, when in Rome! The Total War series’ biggest draw has always been those vast sweeping battles, and while in past years they’ve looked good from a distance until you zoomed into the general clunkiness of it all, now they’ve evolved… a bit. Units have been rendered to take damage, gain wear on their armour, and each man moves differently from the figure beside them. When they are tired they droop, and when they panic, they panic! Zooming into the thick of a battle will up the volume, and the sounds of singing swords and screaming men will be music to your sadistic ears. Unfortunately however you will need a very powerful rig to do the graphics justice. Frame rates are shocking, so expect to begrudgingly be sliding those detail settings down from very high, to high, to medium just to make the game run. The battles are still nowhere near as visceral and violently satisfying as some other RTS on the market, with camera placement a constant problem and having to eternally zoom in, out and all about the figure what you should be looking at. 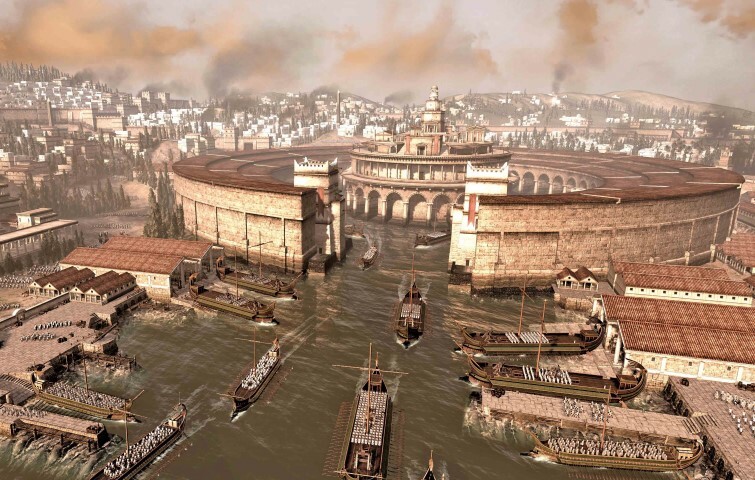 Battles take place on a wide variety of richly detailed maps, from cities to forests, and best of all, in Rome 2 battles unfold on both land and sea simultaneously, with attacking by sea is just as much an option. Trireme exchanges feel the most exciting of all because of how little the ships of the Classical era could do. You’ll find battles devolving into a game of naval demolition derby as dozens of ships smash thrillingly together. 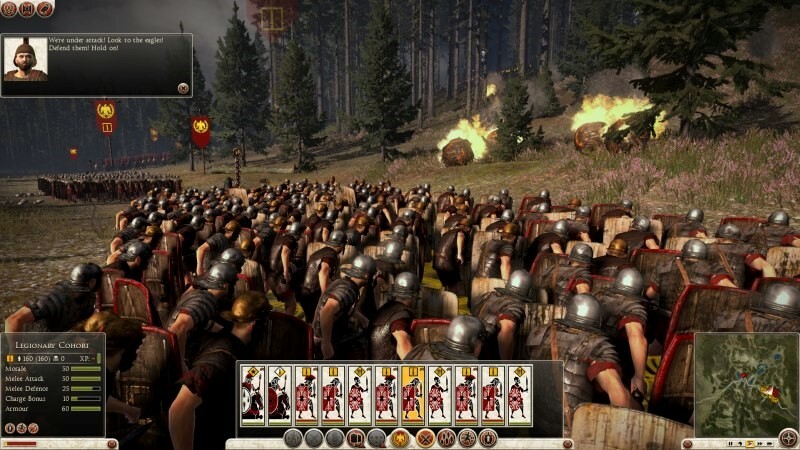 Rome 2 is a very tactical game, and even with a superior force, maintaining skilful troop formations and understanding each unit’s strength and weakness can be key to winning a battle. Morale, fatigue, and weather conditions also play a role, as do terrain features like buildings, streets, valleys or copses of trees for staging ambushes and creating choke points. When moving about the larger world map, armies can also be set to automatically pillage for resources, ambush foes, or build defensive structures. Rome 2 is not a game for the Starcraft-set. There’s no knocking this game over in a few hours. It’s not Civilisation either, where you can complete a game pulling an all-nighter or two. A successful Rome 2 campaign will take you weeks. There’s a lot to manage (Rome wasn’t built in a day! ), and the need to constantly keep an eye on your gains instead of steamrolling through Europe may be turn off for some. However if you do like that Civ-style administration structure, this game is just what your power fantasies have been craving. 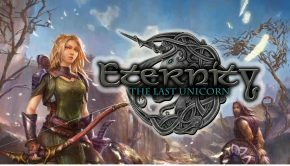 There is certainly a lot to micro-manage; war expenses, famine, poverty, civil unrest, slavery, culture, and trade routes – the game is as ambitious as it is intimidating, and not one for the feint-hearted. 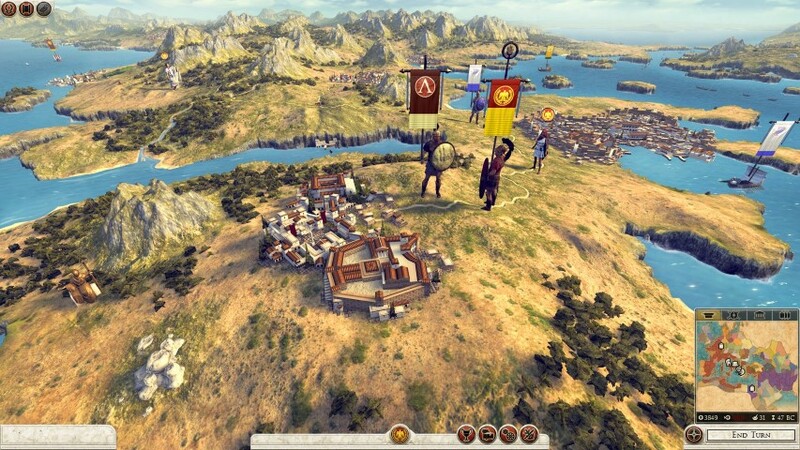 If you’re a history buff, and a lover of drilling down into all that ancient detail, Rome 2 may well be your dream game. Yet of course, it’s not without its flaws either. A few play-bugs, while not exactly game-breaking can be annoying, but these will hopefully be fixed as patches roll out over the coming months. Maybe I’m too generous in my old age, but I’ve come to accept that playing a game in its release week means there will always be some pain. Another thing, the AI is not the best. The computer’s battle strategies are sometimes downright idiotic, and have saved more than one of my own incompetent generals. This is another thing I’m sure patches will tweak soon enough, much to my eventual chagrin. Perhaps because this is my first Total War game I’m easier to impress. Maybe long-time fans will have beefs with an unresolved issue or game tweak. 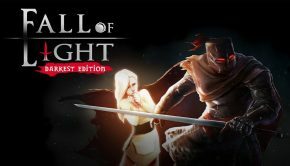 All I can tell you is that if you’ve ever dreamed of slipping on the sandals, donning that toga and sharpening up that stiletto dagger, this is the game for you. You’ll learn a lot of history and you’ll have a deal of fun, and maybe after a month or two, you’ll be the most powerful person to ever cast their shadow across the ancient world. Just make sure your PC is as powerful too.